Speedsurfing is a windsurfing discipline. It is about going as fast as possible on water, only wind driving you. The feeling is great to fly over the water, hanging in your harnass just a few inch above the watersurface, it feels like going 200km/h+ in a car. Still when you loose control the water will make the crash not very dangerous for your body/health, take a look to the safety & guidelines for more info. Nowadays speedsurfing results are inbetween 30kn (55km/h) and 50kn (92.6km/h), it can be as challenging to get 30kn in 15kn wind to win a dayranking or chase records at 50kn in >50kn wind. After learning the windsurfing basics (gliding/gybing/etc) you can start speedsurfing. 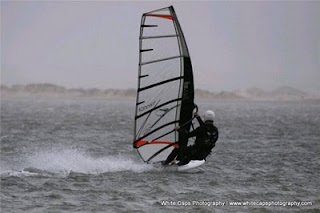 On many windsurf schools windsurfing basics can be learned in a few lessons (5-20 lessons). You will learn going and turning in 1 hour! The first part will be slow (be patient), but after your first gliding (planning) experience you will be hooked for life. Get some experience on freeride gear with gliding, and you can start with the first speedsurfing steps. Speedsurfing competition and the records started in 1977 with Derk Thijs (dutchman) with the first record on the windglider (19.09kn/ 35.37km/h). Till 2004 speed were measured over a lenght 100m/250m/500m/1852m, by using videotiming the speed could be calculated. Since 2004 handheld GPS's are being used for recreational use, since 2009 there is a possibility to claim speedrecords with 2 handheld GPS devices. GPS-speedsurfing.com is a place were over 3000 members regular post their speed of the day, this is the place you can find many fun speed events. The current windsurfing speedrecord is held by Antoine Albeau, he did 49.09kn average over 500m (videotiming). The recordholder by GPS is Tony Wynhoven he did 47.88kn average over 10 seconds.